The ceremonial wooden display case has dimensions of 28 inches in width X 16 inches in height X 4 inch depth (interior depth of 27X15X3.25). It is made from solid wood and consists of an acrylic door with gold hinges and metal brackets for hanging on the back. There are two wood color options which include Cherry Wood and Walnut. This display case includes hardware and materials for hanging scissors, and a picture frame. 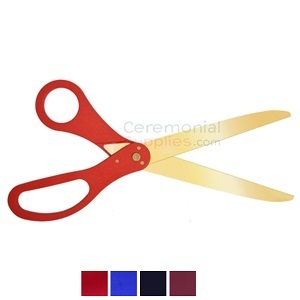 Add a scissor lapel pin to attach to a cut of ribbon used in the ceremony for decoration. The hooks are placed at an angle to accommodate up to a 30 inch scissor.